Royce Doyle (Sonny) Mathews, was born on May 2, 1946 and passed away March 29, 2019 after a courageous battle with cancer. Sonny married his childhood sweet heart on July 26, 1965. Sonny and Liz had 4 children. Sonny served in the United States Army and National Guard. He worked at several jobs before he finally found what he truly enjoyed. Some of those jobs included driving a truck for Pepsi and working at Automatic LP Gas. His passion was in air condition and heating. He worked at Reese A/C for Jimmy Green for many years. He retired from Long Air Conditioning in 2011. After retiring he found a new love with wood working. His children and grand-kids benefited from his awesome talent. As well as starting a side business making rustic cooler and trash cans and hampers. Sonny was proceeded in death by his parents David and Juanita Mathews. Survived by his loving wife of 53 years Elizabeth (Liz) Mathews. Daughter Tammy Lynn Phillips and husband Austin (Sandy); Son Richard (Ricky) Mathews and wife Susan; Son David L. Mathews and wife Tamie; Daughter Rebecca (Becky) Fisk and husband Johnathan. Nine Grand children Amanda and Austin Phillips; Joshua, Christopher and Hunter Mathews; Seth and Kelsey Fisk; Kodie and Dylan Johnson. Thirteen Great grand children; Brother Richard (Dickie) Mathews and wife Sharon; Sister Linda Lou Mathews. Countless Nephews , Nieces and many many friends. The family would like to thank Hospice Plus for their love and care. A very special thank you to all the people at Trail of Life Cowboy Church for their prayers, love and support. Sonny loved playing his bass guitar in the band. Serving as Pall bears will his grand son's. The family will be receiving visitors on Thursday April 4th from 6-8 pm and services on Friday April 5th at 10:00 am at McNutt Funeral Home 1703 Porter Rd. Conroe, TX 77301. Immediately following will be a reception at Trail of Life Cowboy Church 16455 FM 1484 Conroe, TX 77303. To send flowers or a remembrance gift to the family of ROYCE DOYLE (SONNY) MATHEWS, please visit our Tribute Store. 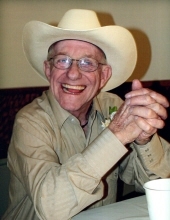 "Email Address" would like to share the life celebration of ROYCE DOYLE (SONNY) MATHEWS. Click on the "link" to go to share a favorite memory or leave a condolence message for the family.